Every year, thousands of clients choose to bring their animals to the Cornell University Hospital for Animals (CUHA). Our faculty, students, and staff strive to provide quality medical care and education for our clients and their animal companions. In the changing economic times, many of CUHA’s clients have found it difficult to affo rd quality medical care for their animal companions, both large and small. These clients are forced to forgo necessary diagnostic procedures and life saving treatments for their animals. To assist clients and patients in need, CUHA has created the Patient Assistance Fund. The Patient Assistance Fund benefits our clients with economic need to help cover medical and surgical costs for their animal companions. 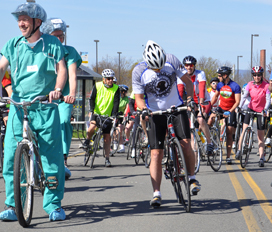 We, the Student Chapter of the American Veterinary Medical Association (SCAVMA), have chosen to support the Patient Assistance Fund at CUHA with this year’s Pedal for Pets bike-a-thon. We invite you to join us! 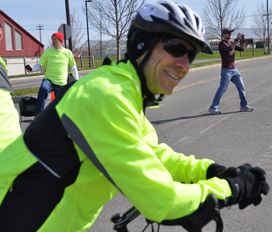 You can join our bikers on a 11-, 30- or 50-mile bike ride throughout Ithaca and the neighboring communities, sponsor a rider, donate a prize at the finish line for our riders, or help us to sponsor the event. All proceeds will benefit the Patient Assistance Fund. Please help us to make the veterinary care at CUHA more accessible to all. Learn more and register for this year's event!